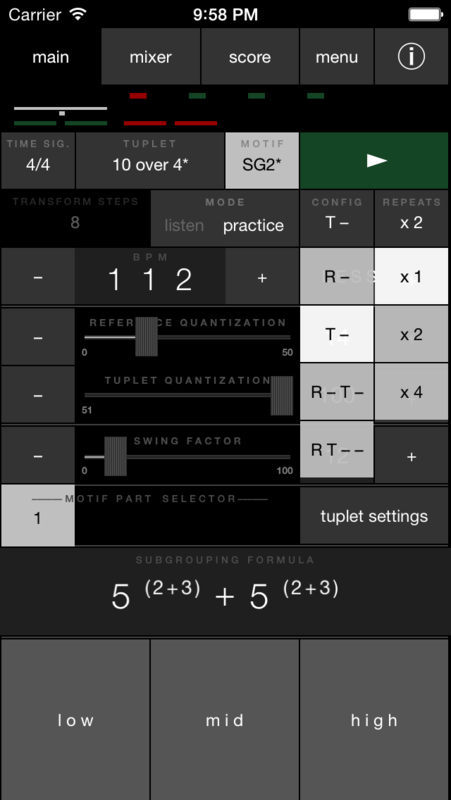 If you want to learn rhythms like quintuplets, septuplets and similar, you will enjoy TUPLET TRAINER. 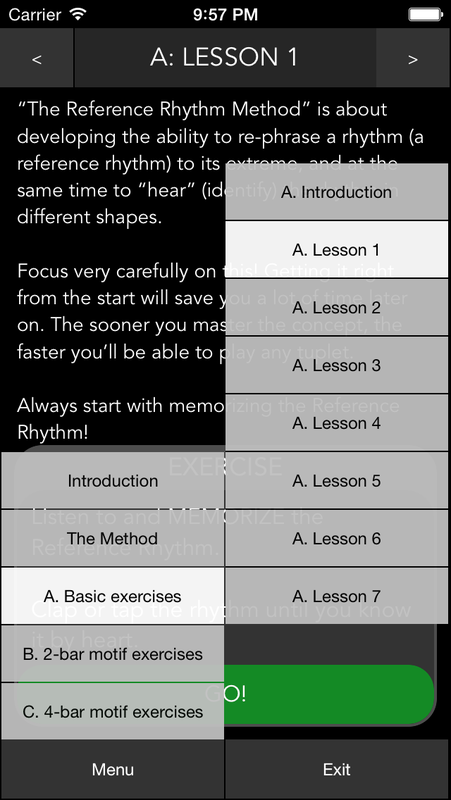 As a musician, composer, arranger, or teacher, you will easily gain access to new exciting rhythmic building blocks that have been very inaccessible before and therefore almost non-existent in western music. Practicing tuplets with this method will not only expand your rhythmic vocabulary: some interesting side effects include a sharper sense of timing, re-phrasing, and subdivision. If you are a stranger to 5/4 and 7/4, practicing the reference rhythms/tuplets in those time signatures is an excellent way to get acquainted with them. With Tuplet Trainer can many doors be opened to different rhythmic opportunities, including those you are not even aware of for the moment. 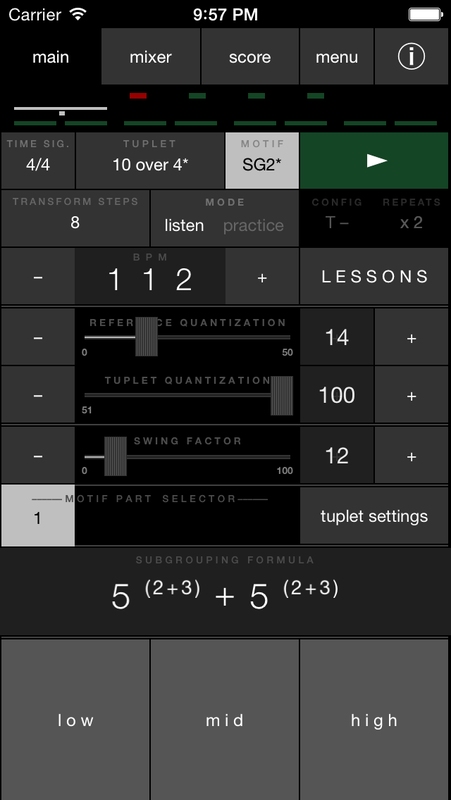 TUPLET TRAINER simulates the method and you can operate the app in either LISTEN or PRACTICE MODE. The LESSONS will take you through the basics of the method. In addition to the TUTORIALS and MANUAL there’s also INFO mode for instant information during usage. You can add a groove (hi-hat and bass drum) to reinforce the feel of the time signature. 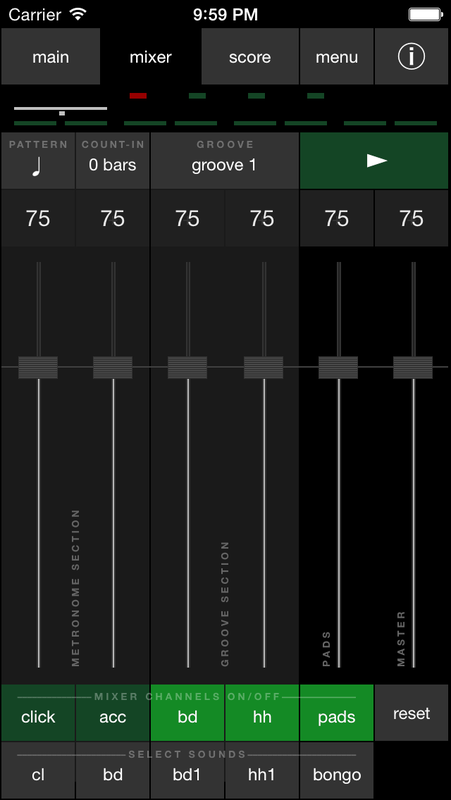 Select different sounds and patterns for the metronome, grooves, and pads. Select from 28 tuplets in 4 time signatures, each with multiple motifs, all in all allowing thousands of combinations. Click on the pictures to enlarge them – click outside to close! On the MAIN PAGE you can operate most of the functions in the app. In LISTEN MODE you can listen to the reference rhythm transforming into a tuplet, in a selectable number of steps. You can adjust the start and end of the transformation with the QUANTIZATION CONTROLS and add “swing feel” with the SWING FACTOR CONTROL. 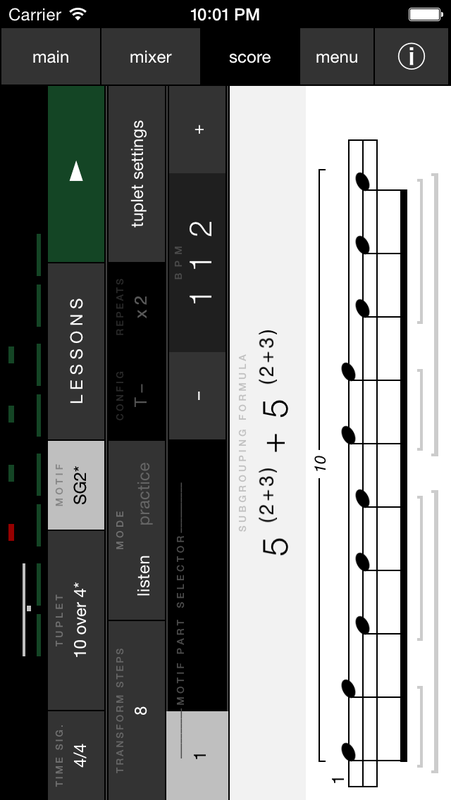 In PRACTICE MODE you can set up different configurations for practicing. On the MIXER PAGE you make volume adjustments and select sounds & patterns for the Metronome and the Groove sections – and sound for the Pads. The LESSONS section will guide you through the basics of the method. There is also a detailed MANUAL as well as VIDEO TUTORIALS and MUSIC DEMOS available on the Internet, reachable from within the app. You can select from 28 tuplets in 4 time signatures, each with multiple motifs, all in all allowing thousands of combinations. Here is the MOTIF MENU for 10 over 4. The motifs can be 1, 2 or 4 bars long. 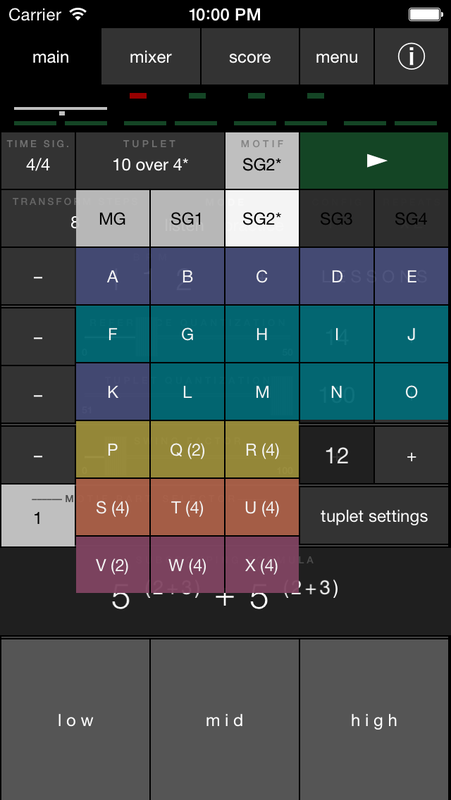 Turn your iPhone 90 degrees to operate on SCORE PAGE – where you find the NOTATION and the SUBGROUP BRACKETS indicating the all–important SUBGROUPING FORMULA.